Disclosure: The items pictured above were sent to me at no cost to facilitate this feature. Not sure if this is the case with everyone's kids but each year when I ask my children to make up their Christmas lists, more and more they seem to be filled with video game systems and games, and high priced robotic toys. There's something to be said for giving your child that advanced tech game or toy; I'm all about Christmas being the time of year to make magical moments happen (as long as you're not breaking the bank trying to do it)! But I also remember (in a more simple time) the joy my little sisters and older brother had unwrapping our favorite board game and the endless hours of fun we had playing those games together. If you're hoping to share some of the favorite board games that you used to enjoy with your kids this year, check out all of the classic games found at Winning Moves Games! They are sure to have something for everyone on your list! I can't even tell you how excited I was to see all of the original gingerbread players, cards, and classic board game pictures in this original game. This is the game that I remember! My four-year-old son Levi got one of the updated Candy Land games a few years back, and even though we had a lot of fun playing it, it had a spinner instead of the original stack of cards and I've got to say, it just wasn't the same and even a little more difficult to play. I think I'm going to be just as excited as he is when he unwraps this on Christmas morning! Click HERE to order Candy Land! Scattegories was another game that my family grew up with. I was intrigued by this new updated version of the original and am pretty excited to play it with our whole family. If you are curious as to how this one is played click HERE to watch a quick 45-second video that explains how this version is played. Pre-teens are always so hard (and expensive) to shop for, but the original Scattergories is one of my oldest daughter's favorites and I'm sure she will be just as excited to play this one as well. If you're looking for a family-friendly Christmas gift to get your teen or pre-teen to spend some family time together, wrap this one up and put it under the tree! Contents:Gameboard, 4 plastic tokens, 4 plastic scoring pegs, 1 scoring pegboard, 2 dice, 40 track cards, 4 large "Go To Lose" cards and instructions. Remember when you could buy a game, unwrap it and just play (no batteries needed)! I must confess this game was a little bit before my time but after watching the video on how it's played, I can totally see myself and my family having a lot of fun with this retro game! My son, Elijah is my "video game kid" and he loves things with lots of fast action. I'm thinking this could be a perfect board game to get him excited to be off the Play Station and on the floor enjoying this game with his siblings! I mean, how can you not love a game that's "never the same game twice"?! Click HERE to order This Game Is Bonkers! This game is another one I confess will be new to our family. No doubt all of my kids though with get an absolute kick out of throwing these pigs around. I suspect it will be a favorite game this year and we'll be "passing pigs" quite a lot in the coming year! Find it hard to get your kids excited about playing a dice game? There's no way they will be able to resist the fun of Pass The Pigs! There's even a handy carrying draw-string sack, which will make it super easy to throw your Big Pigs in their bag and take them along with you to play at Grandma's house. Looking For Games To Fill Their Stockings With? This one gets a big thumbs up from Mom! I LOVE heavy-duty cards! I think games designed for any kids, especially boys, under the age of 10 should only ever be made with heavy-duty cards. Aside from the cards being easy for even my youngest 4-year-old little guy to handle, the game itself is easy enough for him to play and encourages color matching skills. With the fun of trains and animals both included in the theme of this game, it's a perfect stocking stuffer for any of your younger children this Christmas! I'm pretty excited to see how my daughter, Eva, will like this game. She is very mathematically minded so a game of this caliber seems like it will be right up her alley. Most of you know that my husband, Ben, is in construction which makes this game even more fun as she gets to "battle" with her dad to see who finishes the job first! Have a plumber or someone who works construction in your family? This game is sure to get a lot of laughs on those family or friend game nights! If we are ever visiting friends and they happen to have a Rubik's Cube in the house, my daughter Eva always seems to find one! I figured it was time for her to have her own cube and found the perfect one in the Rubik's Bear from Winning Move's Games! Not only is he super adorable, but I love that he's easy to move and turn. We do a lot of sharing in our four-children-family and the ease of this game will be perfect for even her younger brothers to enjoy! We also do a lot of traveling to visit family throughout the year and this game is perfect for in-the-car fun. No cards, no board, no batteries, just this cute Rubik's Bear! This year, when I told my kids to write their Christmas lists, I told each of them to pick out a board game they'd like to play this year. Every year, the older my kids get, I look for more and more ways to encourage them to spend time together with each other and away from technology. Playing family board games is something my kids always look forward to and I'm so happy to have found a company like Winning Moves Games that makes that easy to do. With classic games like Pay Day, Aggravation, Guess Who and so many more, the hours of family fun are endless! With so many of their games under the $25 dollar price point, Winning Moves Games also makes filling up the space under the Christmas tree (and in the stockings) affordable for any family this Holiday Season! 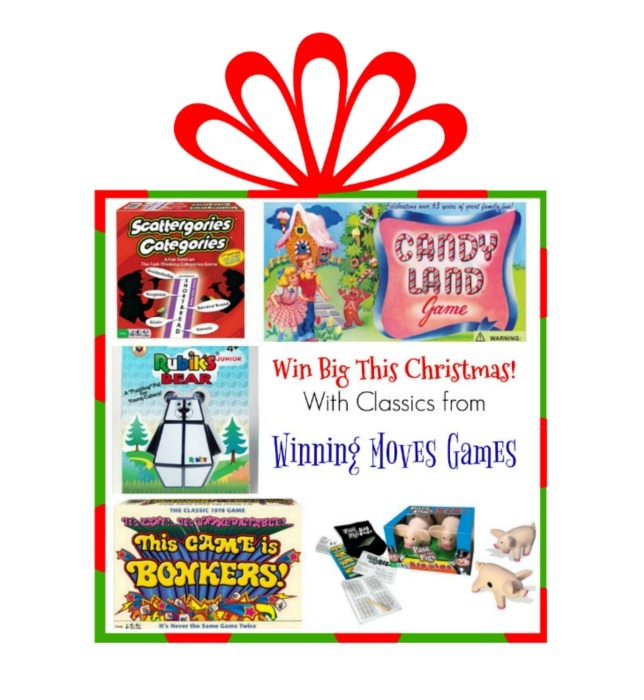 Click HERE to visit Winning Moves Games and check out all of the new and classic boards available for purchase this Christmas! Follow Winning Moves Games on Social Media to hear about the latest Classic Board Games and holiday promotions! One lucky reader will get to pick any two games featured in this post! The giveaway will end December 19th at 11:59pm. Open to residents of the US and must be 18 years or older to enter. Enter using the Giveaway Tools entry form below. Disclosure: I was sent the item listed above at no cost to facilitate this review. Prize fulfillment is the responsibility of Winning Moves Games and not Our Southern Style, or Thrifty Nifty Mommy. 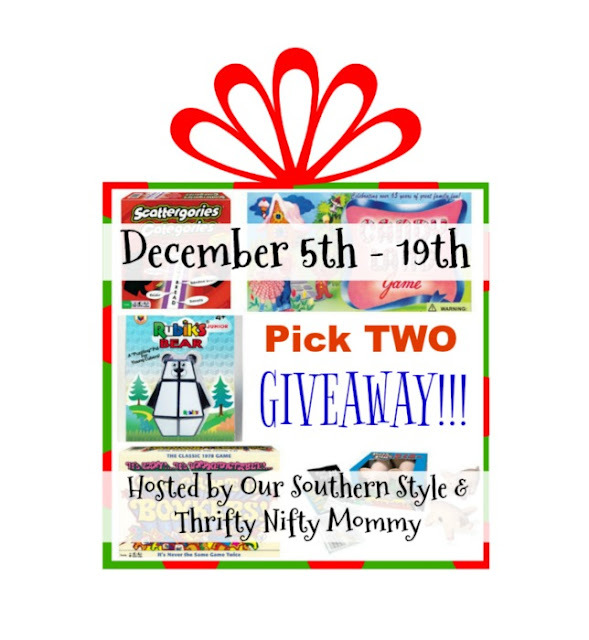 This giveaway is not associated with Facebook, Twitter, Instagram, or Pinterest. Twister!! Twister has always been one of my favorites!! Gets everyone active and having so much fun!! Definitely Uncle Wiggley! My 4th grade teacher read us a chapter from these books everyday until the book was finished. When my brother got this game for Christmas, I was in Heaven. I love the game upwords! I have always liked Monopoly! Tile Lock Super Scrabble Game is FUN and educational for the whole family! We already play Super Scrabble, but we have had the board ruined by our cat jumping up onto the table. This tile lock game would be great!! Thanks! Classic Twister is my favorite. Good way to wear everybody out that has unused energy galore. I think it is a must have for anyone that has little boys. We love the Classic Sorry game! My favorite classic game would be Aggravation. My granddaughters like to play Hi Ho Cherry O.
I also like Pass The Pigs. I would love to get Uncle Milton's Ant Farm® Game for my three children! :) They would have a blast playing this together! I think my favorite might be Clue!! I haven't played that in forever! !